A truly indulgent pancake recipe, this is something you’ll want to eat more often than just once a year on Pancake Day! Ideal for breakfast or dessert, the strawberry, caramel and yoghurt topping is also delicious on toasted waffles or slices of Madeira cake. In a bowl, sprinkle the sugar over the strawberries and leave to macerate while you make the pancakes. Switch your oven on to a low heat. 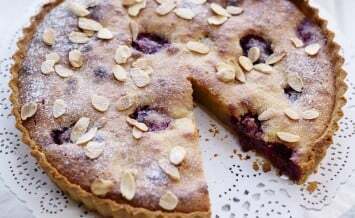 Place the flour in a bowl and gently whisk in the milk and eggs so you have a lump free batter. It should be the consistency of singe cream. Heat a medium sized frying pan on a medium heat then wipe it with oil. Ladle enough batter into the pan to coat the base with an even, thin layer when you tilt it around the pan. Leave the batter to stand until the top side looks dry and the bottom is golden, usually around 30 seconds. Using a fish slice or a flick of the wrist, turn or flip the pancake to cook the other side. Once cooked pop it on a plate, cover with foil and keep it warm in the oven. Repeat this till all the batter is used up and you have a pile of pancakes. Gently fold the juicy strawberries and caramel through the yoghurt till it just ripples. 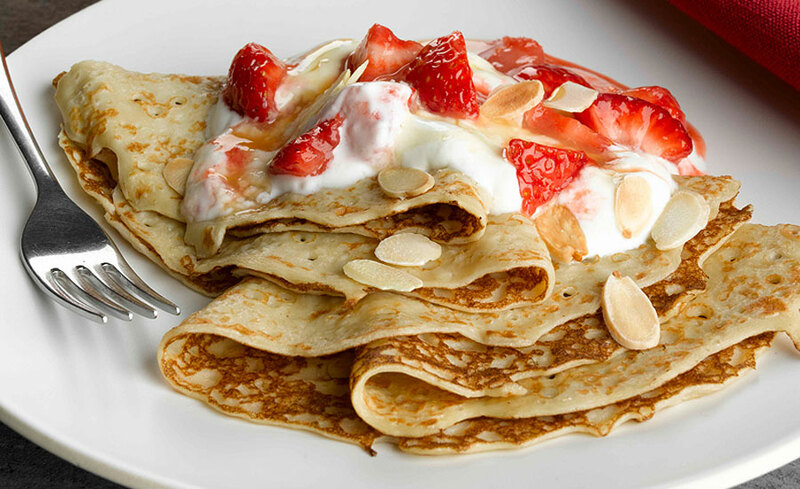 Serve 2 pancakes per person topped with a dollop of the yoghurt mixture and scatter with almonds.